The team, led by chemistry Professor Stuart Licht, aims to convert carbon dioxide to carbon nanotubes on a massive scale to impact climate change. A team of George Washington University researchers were named as finalists in the $20 million NRG COSIA Carbon XPRIZE competition on Monday. The team’s project C2CNT, which stands for Carbon dioxide to Carbon NanoTubes, is one of 10 finalists advancing to the final round. The C2CNT team is led by Department of Chemistry Professor Stuart Licht. The team uses low-energy, low-cost technology developed in Dr. Licht’s lab located at GW’s Virginia Science and Technology Campus to transform carbon dioxide (CO2) into widely useful and highly valued products—carbon nanotubes. These lighter-weight alternatives to metals are strong and highly conductive. They are currently used in airline bodies such as the Boeing Dreamliner, high-end sports cars, nanoelectronics and to store energy in electric vehicle batteries. Previously, there was not a cost-effective method for preventing greenhouse carbon dioxide emissions from the burning of fossil fuels or eliminating other CO2, which is causing global warming, Dr. Licht said. 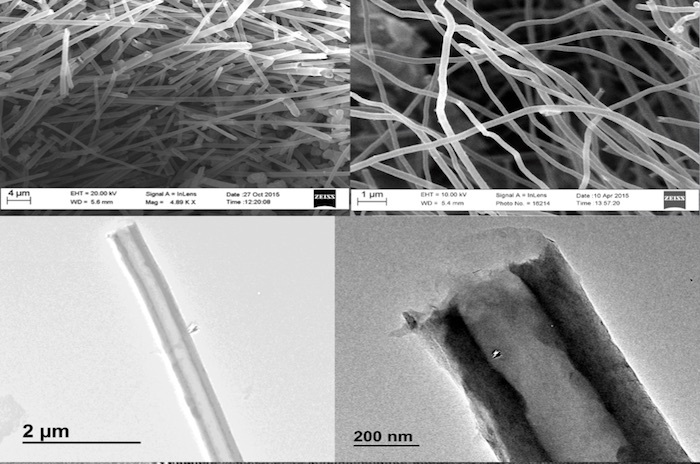 Microscopic view of carbon nanotubes created from carbon dioxide using the C2CNT process. In addition to developing economically viable products that utilize CO2 emissions from power plants, the Carbon XPRIZE competition aims to scale up these technologies to a point that can significantly impact climate change. The conversion of CO2 to pure carbon nanotubes provides the most compact form to capture carbon dioxide and mitigate climate change. “Scaling of our C2CNT process is progressing, and C2CNT operating with an area equivalent to less than 10 percent of the area of the Sahara Desert is sufficient to heal the atmosphere to pre-industrial atmospheric CO2 levels in 10 years,” Dr. Licht said. The C2CNT process can utilize CO2 captured directly from the air or from an industrial smokestack. The CO2 dissolves easily into molten lithium carbonate. By adding electrodes and running an electrical current through the liquid, one electrode generates oxygen and the other carbon nanotubes. In the semifinal round of the contest, teams were judged on how much CO2 they were able to consume, the size and value of the markets for their CO2-based products, and their efficiency in using energy, materials, land and water. For this final round of the competition, which runs until 2020, Dr. Licht and the C2CNT team will convert CO2 emissions from a natural gas-fired power plant in Alberta, Canada, for a chance at winning the grand prize. The GW C2CNT team is focused on a comprehensive solution to climate change, a principal challenge facing the planet today. The C2CNT path started in 1987 with Dr. Licht’s theory and experiment for the efficient use of solar energy to drive simultaneous electrical and chemical production and new room and high temperature electrochemistries to store energy. The C2CNT process is the culmination of 30 years of ongoing development of a technical solution to a sustainable future. GW researchers who developed a method to turn carbon dioxide into an in-demand resource received the 2017 Duke Energy Renewables Innovation Fund Award.